Unusual and typical cultural monuments in Riga are the suburban residences of the affluent and influential bourgeois - summerhouses and manors. Our Website provides unique compilation of information and images about these monuments. In order to provide a full sight here have been examined all monuments of culture which in different sources of information have got the proud name of "castle" or "manor" - including medieval castles, monasteries and convents, pastorates and opulent mansions. 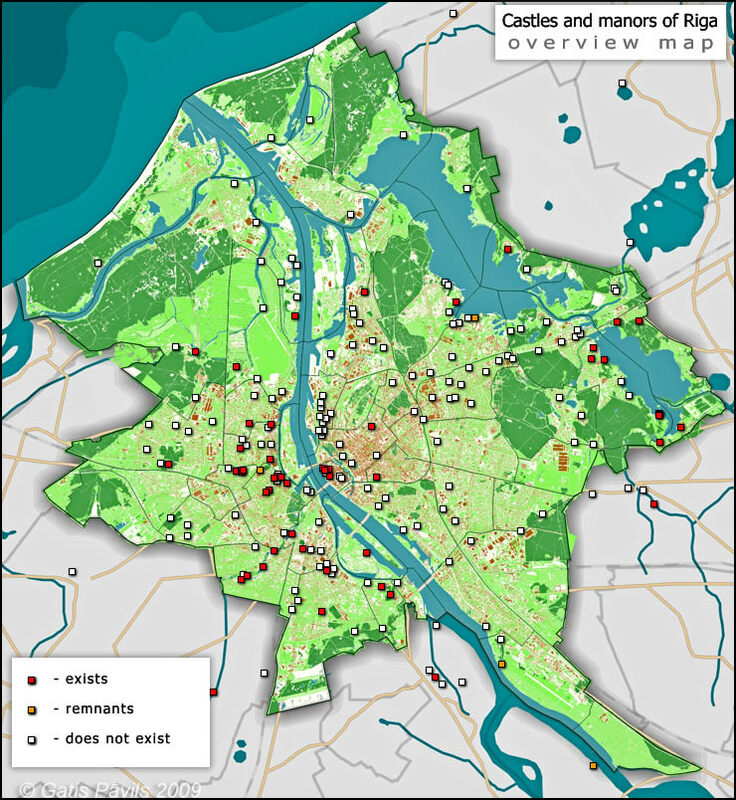 Website contains also an interactive map of manors of Riga. 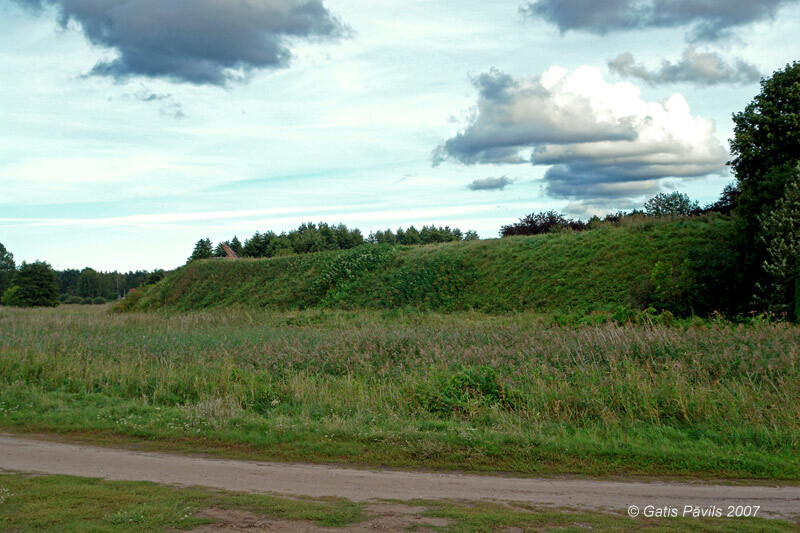 Earthen ramparts - all what remains of Daugavgriva medieval castle. 2007.09.01. Some of the first masonry buildings in the area of present-day Latvia were castles. And some of the first castles were built in Old Riga. In the small area of Old Riga there were built 4 - 5 medieval castles during the medieval times, since 13th century. Now there exists only the newest, Riga III Order castle built in 1515. Outside Old Riga, in the area of present-day Riga there were some more fortified buildings likened to medieval castles - for example, Daugavgriva castle, Red tower of Riga and others. in suburbs of Riga there were built manor houses already in medieval times. Unfortunately these buildings have not survived up to this day - although in Rumbula neighborhood up to the 21st century there was standing Little Jumpravmuiza manor with a history stretching up to medieval times. There is little evidence about manor houses from Rennaisance and early Barrocco times from the 16th century to first half of 18th century. Sandy and marshy areas around Old Riga were comparatively sparesly populated and here were established small suburban farms of affluent townsmen. Valuable monument of these times - old Balozi manor house from 17th century - is relocated to Latvian Ethnographic Open Air Museum from the nearby Bonaventura manor coomplex. In Old Riga on Maza Pils Street 6 there is located pastorate of St.Jacobs Church from the first half of 17th century - it has been rebuilt later though. In 16th century there were 43 such manors in Riga, at the end of 17th century - 93 manors (2). There exists a possibility that in suburbs of Riga there still is standing some small, unsighty, rebuilt wooden manor house building from these times. 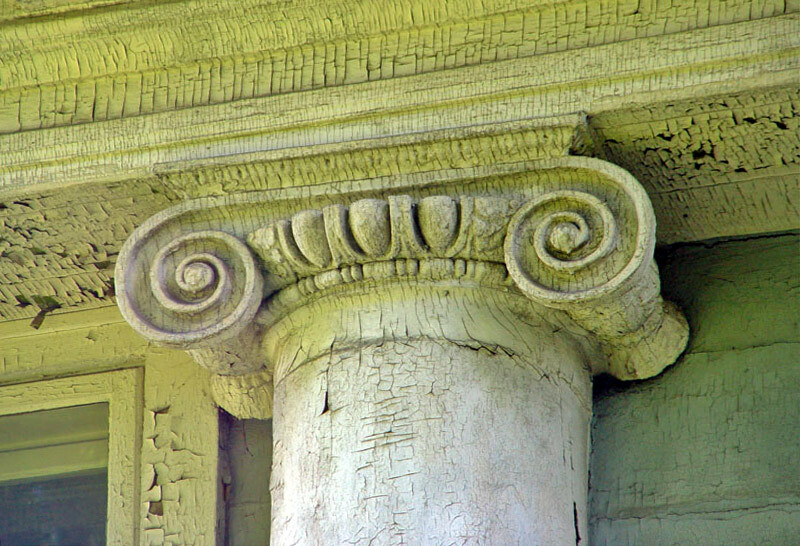 Feature of Classicism style - capital of column. Volfsmit manor. 2004.07.17. At the end of Barocco time - second half of 18th century - Riga was recovering from lengthy wars and epidemics, people in the town were getting better off. Overpopulated, polluted downtown was not a pleasant place for living and the more affluent townsmen were searching for a better life closer to nature. 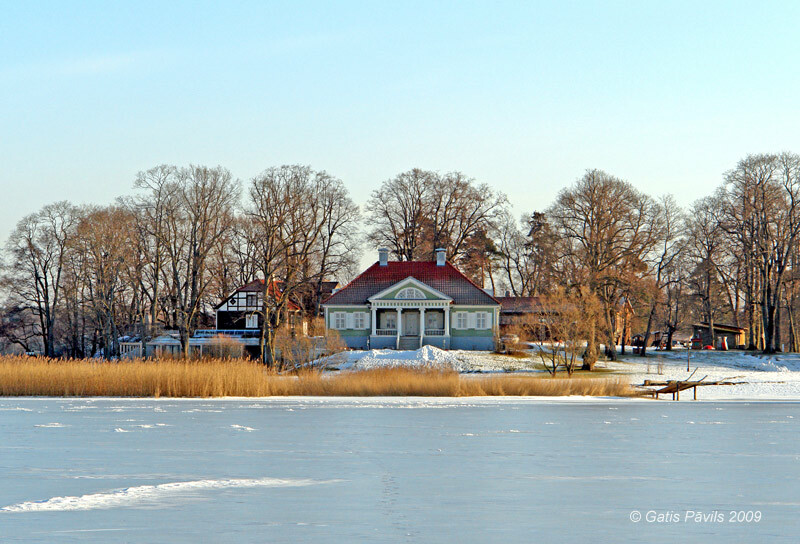 There started "golden age" of Riga manors - tens of new and stylish summer houses were built and carefully tended, beautiful parks planed around them. In several occasions there were rebuilt and adjusted older Rennaisance time manor houses. Part of manors were built next to suburban manufactories - for the owners of these factories it was comfortable to live nearby. This tradition continued up to recent times - solitary villas of factory owners were built next to their factories up to the end of 19th century - for example, mansion for owners of Kimmel brewery. At the end of 18th century and in 19th century manor houses were built in Classicism style and landscape parks were planted around them. Riga became larger and larger and in some occasions owners of manors were dividing their land into smaller parcels and renting them for construction of other buildings. Suburbs of Riga were burned down in 1812 when the troops of Napoleon approached Riga - and there are no doubts that numerous wooden manor houses perished in fire then. More pleasant locations became easily available with the construction of railway lines at the other half of 19th century - especially in area of present day Jurmala. Life in suburbs of Riga was changing too - with dizzying speed there were built numerous factories and quartals of apartment buildings - rural manor houses were lost among the masonry buildings. Owners of manor houses managed rather often to keep the well tended parks as their property and these parks were not covered with buildings. But in general the value of suburban land increased sharply and there was no possibility and reasoning in creation of new, wast manors near the city. Age of Riga manors was coming to an end. It seems that the last building which could be considered to be a manor house is Senbergi manor in Bierini neighborhood, built in 1906. This beautiful wooden building has got similarities with laced Jugenstil summerhouses - but there is stable for horses next to it and we could assume that during the construction time here was rural landscape. The renovated Zeluste manor. 2009.02.01. As the time went by more and more manor houses did not fit in the stucture of growing city. Often there is required a distance in time to see the real value of things. Too many manor buildings did not have this distance of time and were torn down to give a place for new buildings. Many were simply abandoned and slowly decayed and perished. Only in the beginning - middle of 20th century the value of manor houses was noticed and valued. Ensemble of Balozi (Bonaventura) manor was disarranged - the old manor house building was moved over to the nearby Open Air Museum, remaining buildings were used for the administration of museum. In the other side of the city the professionals of architecture heritage - renovators - renovated the unique Blokmuiza manor for their office. Unfortunately several more decades passed until there started a targeted renovation of other manor houses. 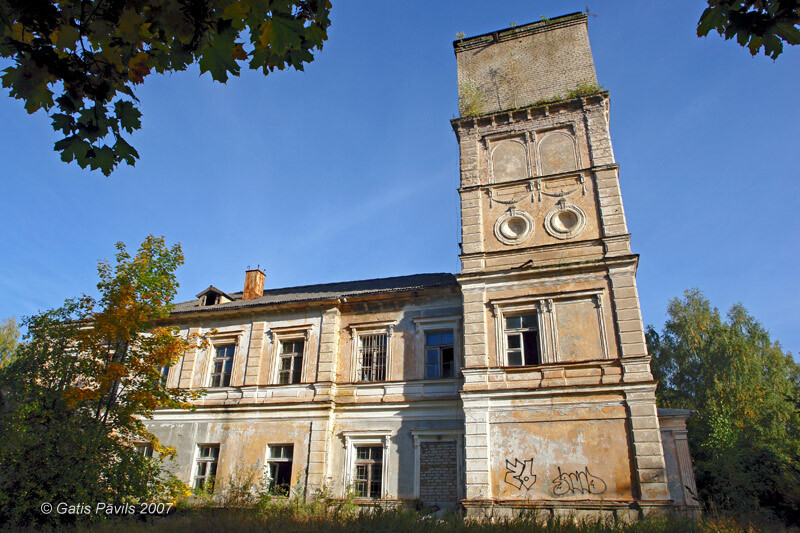 Major part of manor houses in Riga have not found proper owners and are either abandoned or are used in an inappropriate way which leads to degradation. But there still exists a possibility to save rather many of these priceless buildings. Ownership of a centuries old manor house with park inside a city seems to be the most exlusive testimony of high status and refinement. It is also hard to imagine a better possibility to obtain a much sought-after location for high-level parties and social gatherings so close to the centre of city. Still there exists such a possibility. Manor houses of Riga with their subsidiary buildings and parks constitute a specific, special manifestation of urban culture adding one more dimension to the rich and diverse architecture heritage of Riga. Suzi palace - little known Neorennaisance palace in Riga. 2007.09.24. For most part these manor houses are wooden buildings and major part of existing ones have been built in Barocco and Classicism style forms. For most part Riga manor houses are rather small buildings with one floor. Buildings intended for more practical uses and inhabited throughout the year might have two floors - for example wooden house from late 18th century in Daugavgrivas Street 67. With a wide scope there was shaped a landscape around the manors. Manor parks still have preserved remnants of the former beauty - especially impressive in this sense is the wast Bisumuiza park. Also the interiors of the buildings still have many values - in some places there has been preserved polychrome paintwork and old tapestry, trim of doors, windows, stoves and other elements. Distinguished interiors of Borhert, Nordeki, Kleisti, Zeluste manors have been studied but other manor houses promise interesting finds as well. There are several interesting palaces in Neorennaisance style from late 19th century - such as Suzi, Anninmuiza and Kregermuiza palaces. It is weird - but these buildings which are a lot better suited for contemporary needs, have been abandoned or degraded. Kaupuža D. Rīgas muižiņas. Latvijas architektūra (61), 2005/5, 94-98.lpp. Zilgalvis J. Mācītājmuižas Latvijā, Rīga, 2002.